In this article you’ll learn how to overcome kiteboarding difficulties, shake off bad luck, learn from problems caused by your own poor judgement, and most importantly realize that YOU (yes you) are on a Hero’s Journey. Ok! Let’s jump right in! Difficulties and misfortune happens. Things are going to go wrong out there people! Sooner or later (or both) you’re going to get into some kind of trouble with your kiteboarding. There’s 3 types of trouble we can get ourselves into: bad luck, bad judgement and the hero’s journey (one who is a seeker of adversity.) Time to break’em down. Things outside your control don’t go the way you want. Example: you book a kite holiday for a typically windy season in the destination and GUESS WHAT – there’s no wind. It happens to ALL of us. When this type of adversity comes up here’s what I want you to do. Just get over it. Deal with it. Move on. Watch Taylor Swift’s “Shake it Off” video on Youtube. Figure out a different way to play. Go surf! Take a yoga class. Drink mojitos in the swimming pool! Anything but complaining about the wind or lack thereof. Give back by volunteering. Find a local organization and donate your time to a good cause. In Cabarete you can read books to kids at the local Montessori school or support the older girls by drinking coffee and eating yummy food at Cabarete Coffee Company, a social business run by the Mariposa DR Center for Girls. Work on something awesome. When things OUTSIDE your circle of control are making you mad it’s time to shift gears and invest energy in the things you CAN control. Already know your special gift to the world? Figure out how you’re going to share it. Or start to implement the ideas you already have. No idea what your gift is? Go for a run/walk on the beach/bike ride and it might just start to come to you. I wish I could say “Yo people! Just use GOOD judgement and you’ll avoid trouble,” but the truth is that screwing things up happens to the BEST OF US. Even me. Sometimes especially me. That’s why I’m super thankful for Pete and Maxine who work with me here at LEK and keep me in line! But seriously, who out there has NEVER had misfortune because of something you’ve done and now you’re in trouble? No one! And in kiteboarding? Forget it! I could list a million reasons but here’s just a few examples of poor judgement calls I see all the time in kiteboarding. I could keep going, but I’ll spare you. What have you seen out there? Let me know what else belongs on this list in the comments section of this article. First things first. Prevention really is the best medicine. Learn all you can. invest in your kiteboarding knowledge. Come take a kiteboarding lesson at LEK! Watch my kiteboarding videos on YouTube! 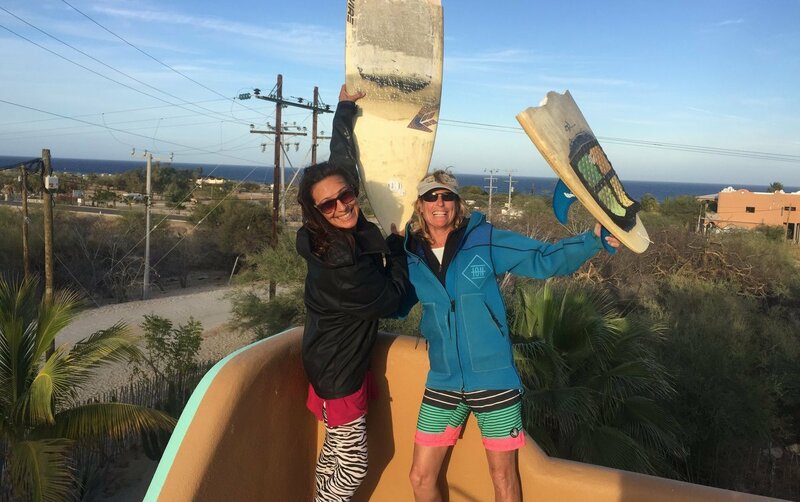 Read my other Learn How to Kiteboard with Laurel Eastman articles with tips and tricks! In kiteboarding, what you don’t know CAN hurt you. And more importantly, it can hurt others. With great power (like a huge traction kite) comes great responsibility (not hurting people or damaging their personal property.) Learn young jedis, learn. Secondly, some things you’re gonna learn the hard way. When you royally (or minorly) screw things up you MUST (I repeat YOU MUST) debrief properly. Every time you have near misses or actual real troubles when kiteboarding do this: Stop. Think. Analyze. Ask yourself: Was that bad luck or poor judgement? If it’s the later, make a concrete plan for how to do it differently next time. It’s a thing people, and it’s called POST TRAUMATIC GROWTH. Learn from your last mistake, and be ready for the next challenge, cause they’ll keep coming, that’s a promise. If you’ve read this far into my post then good for you! And here’s your reward. I’m here to tell you, in no uncertain terms, that YOU are on a Hero’s Journey. What does that mean? Glad you asked. And I’m going to let you in on something big here. The brain-power skills you learn by dealing with adversity in your kiteboarding practice are going to make you a much better person off the water. Case studies can be helpful, so they tell me. Therefore my friends, here’s a little story about 24 hours of kiteboarding difficulties and how I managed them. I put a big old ding in the my dear friend Jeanne Simon’s kitesurfing surfboard. I immediately stopped kiting, told her what happened, offered to buy the board, and arranged for an immediate temporary fix (SolarRez) so she could use it that evening and the next day. Later on. Thinking more deeply about my judgement and how it broke. I was rushing out of the water (slow down, Laurel), I didn’t time my exit with the swell (slow down), I could have gone 20 yards downwind to a less rocky area (be less lazy). The last thing I did was to arrange for a professional fix. The board is now better than new, because every time she sees the repair she’ll think of her friend who loves her. On a totally side note, check out my latest Youtube video featuring Jeanne, you’ll learn how to pack 2 big kites into 1 tiny compression bag…. Gearing up for our group downwinder. Everyone’s downwind kiting out in the water and waiting for us. Rigged up, we’re about to launch the 8m Best Roca in 25 knots. Pete notices the eject plastic molding piece is cracked. Looked at our options: Ignore and put ourselves in danger, Pete doesn’t go, we can rent kite from our friend, or fly our Best kite on our Ozone bar. We went for option four and adjusted our original gear usage plan. Using the wrong bar with a kite is possible, but sub-optimal. We had to tie a knot in the end of the center lines flying line pigtails to make it work. But it worked! I took the bigger kite with the wonky bar because I’m the more experienced kiteboarder. Riding along. Loving the board my OTHER girlfriend (the legendary Cynthia Cynbad Brown) loaned me to test. Out of nowhere a loud CRACK and rapid deceleration. I eased off the bar, but kept the kite flying. Tried to ride the broken board and got a small scrape from the sharp edge. Broke the board totally in half to attempt to ride the nose like a skimboard while holding the tail. Realized I was going to hurt myself doing that because I was pretty under-powered at that stage. Body-surfed in, corralling the two board pieces with me. The best ever kitebaording buddy Pete Richardson met me on the beach. He landed me with his kite flying, then I landed him. We decided against me hitch-hiking back. He gave me his board and I continued. One more really important tip here. When things are going wrong in the water, if at all possible do this. FIRST stay calm and SECOND fly kite to the beach if you can. It will make it easier to get home and keep you safe from the lines being in the water and wrapping around you and cutting you. Because when you get cut, then you bleed. Then a shark comes! Which bring me to the final “difficulty” (yes there is more) in my 24 hour adventure. Back at it. Wave chasing. No one else around. All of a sudden, under my board darts a medium (my size) black shark. Now, I’m going to let you in on a little secret. Seeing a shark while kiteboarding has been my dream for about 5 years now. WHAT?! Yes, you heard me right. Am I scared of sharks? Maybe a little, I am human. Do I want to encounter and be delighted by them – HECK YES! My personal embodiment of being a hero on my own Hero’s Journey. My dream had come true! I looked around, realized I was pretty all alone, and so even though the shark was very non-threatening I decided to hightail it to the beach, and the hot tub. Bottom line. Adversity happens. Different types take different responses. Respond to bad luck with an “oh well” attitude. Don’t beat yourself up, inside your head or with your powerful words. Practice good judgment. And if you don’t, still don’t beat yourself up. Treat adversity like an opportunity. Seek out sharks in the ocean. Face your fears. Be brave. Be thoughtful. Be awesome. YOU, my friends, are also on a Hero’s Journey. Thanks so much for reading this article. Here’s your 2 Calls to Action! Subscribe to my amazing email newsletter. Seriously you’re going to like it! I share tips and tricks, industry news, and keep it super non-spammy or advertise-y. I’m growing a tribe of conscious, courteous, incredible and kind kiteboarders and I want you with me! Scroll up to the top of the page and enter your info on the right. Sneaking in a 3rd call to action here (I love to break rules, even ones I set.) Be amazing. Go out into the world and let it shine.